Semantics and semiology are two of the most important branches of linguistics and have proven to be fecund areas for research. They examine language structures and how they are dictated by both the meanings and forms of communication employed — semantics by focusing on the denotation of words and fixed word combinations, and semiology by studying sign and sign processes. As numerous interrelated fields connect to and sub-disciplines branch off from these major spheres, they are essential to a thorough grounding in linguistics and crucial for further study. 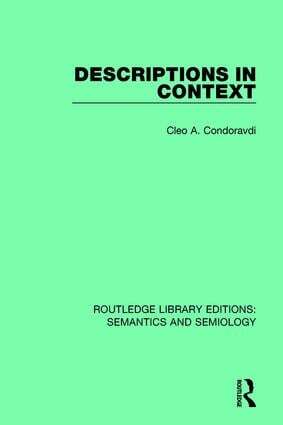 ‘Routledge Library Editions: Semantics and Semiology’ collects together wide-ranging works of scholarship that together provide a comprehensive overview of the preceding theoretical landscape, and expand and extend it in numerous directions. A number of interrelated disciplines are also discussed in conjunction with semantics and semiology such as anaphora, pragmatics, syntax, discourse analysis and the philosophy of language. This set reissues 14 books originally published between 1960 to 2000 and will be of interest to students of linguistics and the philosophy of language.